In many – if not all – of the world’s futures that can be found in distopian literature of the 20th Century, society is ruled by a totalitarian government regime, which scrutinizes the individual like a wide ever-open eye that follows all his or her movements, with the aim of preventing illegality and crime and thus establishing a more secure social order. It’s basically an image-based society, where everything is inspected through photography and video and everyone is filed and categorised within an over-controlled database. 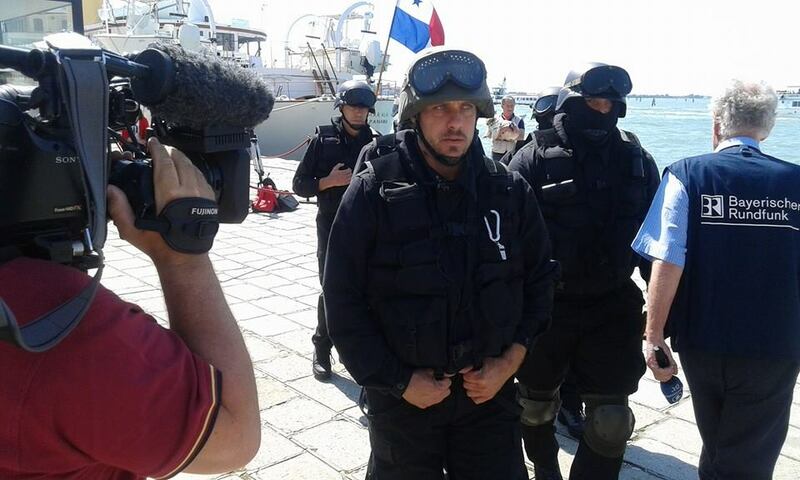 Another recurrent element is the presence of a military force that has the licence to operate outside the regulations valid for the rest of the population. Dystopian scenarios of the future in literature began to proliferate in the last decades of the 19th Century and today it’s generally accepted that the significance of their firm establishment in western culture should not be underestimated: as we read in The Encyclopedia of Science Fiction, “literary images of the future are among the most significant expressions of the beliefs and expectations we apply in real life to the organization of our attitudes and actions.” But what happens if these three layers – literary images, expectations and real life – are merged down and taken as premises for artistic discourse? British critic and curator Mike Watson and Dutch artist Harold de Bree posed this question to themselves, searching for an answer through the creative form most adept at combining art and life: performance. 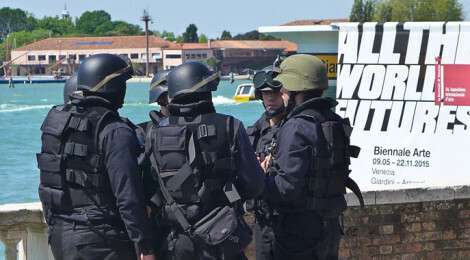 In their project Machines of Loving Grace – recently presented during the opening days the 56th Biennale di Venezia as part of the official collateral event Jump into the Unknown, organized by the South Korean foundation Nine Dragon Heads – a fake surveillance team composed by six personnel traversed the city in an adapted boat and targeted several high visibility spots by performing a series of actions characterized by different levels of plausibility, from standing in a row to staging complex acrobatic choreographies. 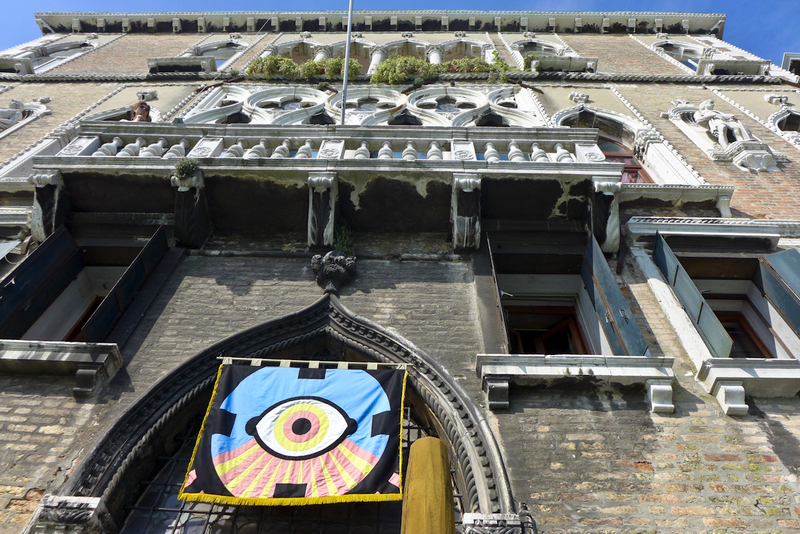 Artnoise was in Venice to follow the set-up of the work, whose aim is to test the audience’s response when this kind of “warlike arrangement” is brought into the peaceful first-world urban environment. 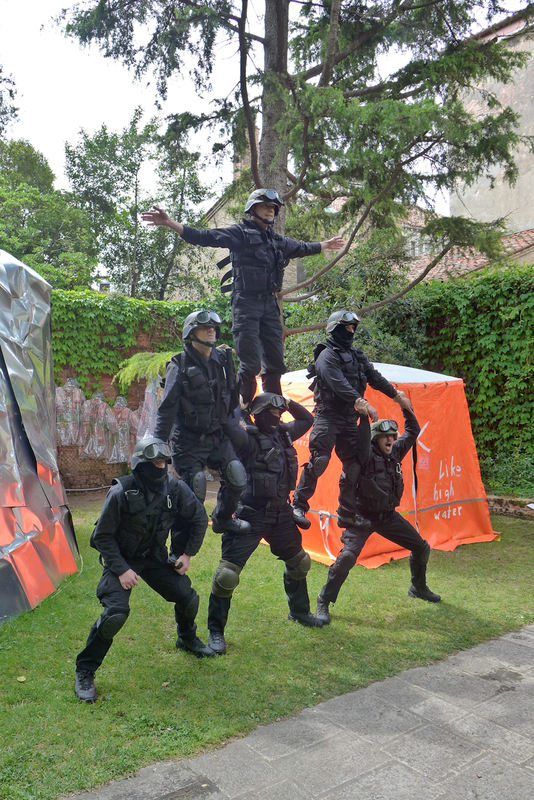 The spectrum of reactions was predictably extensive and even included indifference when, for example, the performers mimicked basic surveillance actions such as walking around in pairs, as if it was normal to meet fully equipped soldiers within the hectic and hyper-crowded context of the Biennale’s opening. After all, to be observed equals to be safe. Though, things were turned on their head when the soldiers started to behave in ways they were not expected to, like bursting into a belly laugh for no apparent reason: the watchers suddenly became the watched and the whole moment moved onto the entertainment level, attracting crowds of curious onlookers and even whole press teams which, armed with all kinds of recording devices, put the troops under media assault. 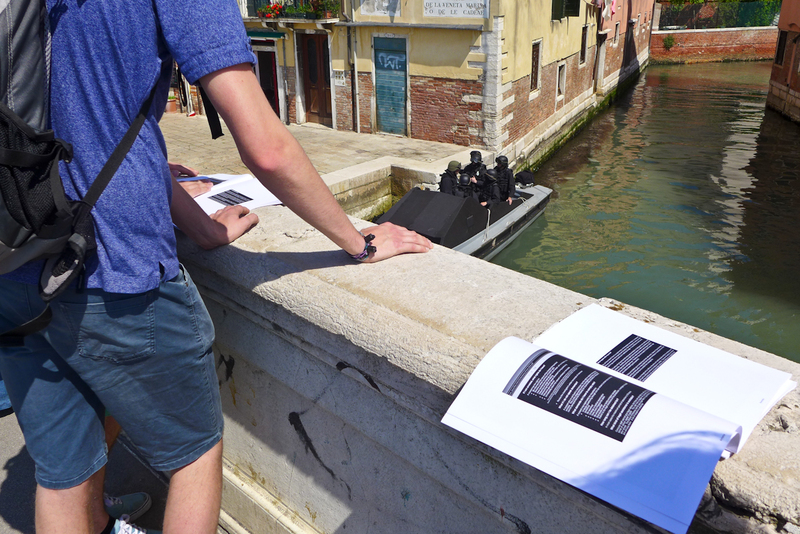 As a counterpart to the temporary subversion of roles, or better as a reminder of the existing hierarchy, the project included Black Flag: a publication made by artist Magnus Clausen listing citizens’ rights upon arrest in all of the ninety participating countries of the Biennale. The performance highlights the importance of the visual aspect in the surveillance game and demonstrates that the video and photo camera – the ubiquitous and most effective means of security technology – is a double-edged weapon. Trying to keep its visual outputs under total control is impracticable for a unique authority, as well as is impossible for the single citizen, being aware of why and how they’re used. In a Biennale strongly oriented towards a socio-political examination of how the work of art can challenge us to look beyond the prosaic appearance of things, Machines of Loving Grace succeeded where other projects failed by taking into exam a central element that belongs to the world we know and distorting it through its own inner contradictions.